In Portland-based Matt McMormick’s thought-provoking documentary Buzz One Four, archival US Air Force animation shows the routes flown by B-52 bombers carrying nuclear warheads at the height of the Cold War in the late 1950s and the 1960s. The B-52s would fly toward the USSR, either over the North Pole or across the Atlantic before veering off at the edge of Soviet airspace. Then repeat, and repeat, and repeat… twelve planes, 24 nuclear warheads, circling 24 hours a day on three separate routes, for years. McMormick’s film, inspired by the experience of his grandfather, Major Thomas W. McCormick, one of those B-52 pilots, follows the same pattern as the massive bombers of Operation Chrome Dome. The film approaches dangerous territory, then turns back. Broken Arrows: “Buzz One Four” was the call sign of the nuclear-laden B-52 piloted by Major McCormick which crashed in a snowstorm on January 13, 1964 in rural Maryland, 95 miles from Washington, D.C. The term, “Broken Arrow” (also the title of a 1996 John Woo thriller starring John Travolta and Christian Slater), describes a lost nuclear weapon. Buzz One Four notes thirty-two other instances when the US military temporarily (or even permanently) misplaced a nuclear warhead. Although the film briefly notes the potential danger and the haphazard recovery of the weapons from the crashed B-52, the line of inquiry halts. 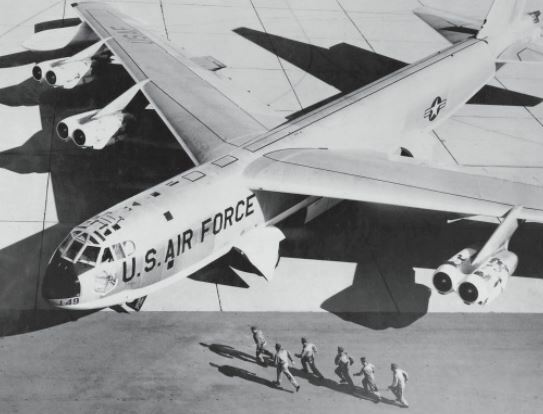 Broken Planes: Boeing hesitated to meet the US Air Force’s request for a long-range bomber which could stay aloft for 24 hours and deliver its payload deep into the USSR, but it built the B-52 nonetheless. The documentary mentions similar incidents, like the crash of Buzz One Four, when vertical stabilizers broke off of B-52s and cost fliers their lives. The film pursues neither the rectitude of the Air Force’s asking men to fly a poorly designed plane nor Boeing’s responsibility to deliver a reliable aircraft. Broken Men: (Spoiler Alert!) Major McCormick and his co-pilot miraculously survived the crash of Buzz One Four. Three other crew members did not. When McCormick interviews one of the crew’s surviving widows at a 50th anniversary memorial, he asks her if sending a nuclear-laden bomber known for losing critical parts in heavy turbulence into a blizzard simply to get it back to its home base was a wise decision. A relative answers: “A lot of lives were changed,” and the widow nods her agreement. Granted, perhaps most of the men involved in Cold War era military planning and daily operations are deceased, including Major McCormick. Nonetheless, did the men who flew Operation Chrome Dome flights, dozens, perhaps hundreds of times (think of Catch-22’s Yossarian), ever question their role or their orders? Broken Men 2: How did the Air Force support pilots and crews flying such dangerous missions? Buzz One Four details how the crews stayed alert for 20-30 hours of flying: Air Force-issued amphetamines. So now, the film has raised the question (time for a nod to Dr. Strangelove), is it a good idea to provide a drug, chronic use of which is known to induce psychosis, paranoia, auditory and visual hallucinations and eventually violent and erratic behavior (according to the DEA), to men flying unreliable jets carrying nuclear bombs 11 times more powerful than the bombs dropped on Hiroshima and Nagasaki? Is it? Given a Kickstarter budget to take on the Pentagon, McMormick accomplishes what he can. Major McCormick, his grandfather, led an epic life in many ways—a World War II bomber pilot, an Air Force career ferrying nuclear weapons, surviving the terrible crash of Buzz One Four and stoically continuing on with his duty—and the documentary’s use of historic Air Force photographs and footage captures it. Weaving in family home-movies, wistful 8 mm color footage of his smiling grandparents and McCormick’s father and uncle in their childhood, reveals an average American family of the Atomic Age. At any moment, Major McCormick appears as if he might be heading off to cook steaks on the backyard barbecue or to play a game of catch with his sons. It is an intriguing juxtaposition—a real nuclear family—but, the film falls a bit short of reaching its target. Thu 12:10 pm , Fri 6:40 pm , Fri 9:10 pm , Sat 12:10 pm , Sun 6:10 pm & Mon 09:40 am at Varsity 4. Charles Fischman writes about life in the Rogue Valley. He plans to write a memoir about Volvo station wagons as soon as he discovers how to save humanity from itself.